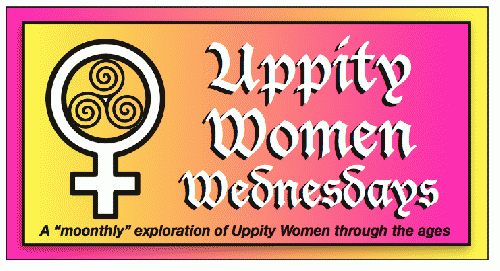 Number Two in the monthly Uppity Women Wednesday Series, started in April, 2014. As men are fond of saying, women are mysterious. Just when a male thinks he's grasped the concept of pampering, of making "mom" feel like a queen for a day, she sends him a look that says "You haven't delivered." The kids can get away with giving mom breakfast in bed, and the handmade cards filled with I.O.U. chore promises. Not the guys, however. Yes, we 21st-Century moms (and grandmoms) are complex. That means that males need to take a stab at something daring and new -- and I don't mean a Victoria's Secret gift card, either. These days, the average mom works multiple jobs, most of them unpaid: caregiver, chauffeur, social secretary, bill-payer. Invariably under-salaried and over-scheduled, she works extra hard at being a good mother. Nevertheless, even when the kids are grown, we constantly question ourselves: is what I do really meaningful? And what about our moms, our female ancestors? Did they feel fulfilled? Was it meaningful, what they did? This Mother's Day, try validating the moms in your life. One way is to introduce her to a wider world of awesome, flesh-and-blood moms, most of whom she won't have heard of. Meeting these gutsy trailblazers will nourish her in surprising ways -- and you, too, I'm betting. Where to look? These daring dames fill many pages of those quaint artifacts that we call books (shameless plug: including eight or nine of mine.) Their stories, filled with humor, courage, and steely resolve, show the astonishing degree to which females have influenced their societies, no matter how long ago. Knowing what such women accomplished, despite staggering obstacles, is powerful medicine. Reading them is a grand antidote to the cynicism, despair and relentless bad news that too often fills the hearts and minds of even the most stalwart moms in our society, me included. Here's proof: meet the unstoppable Mary Montagu, Health Heroine. Early in her marriage, smallpox struck 25-year-old Mary. She had the type called confluent; the pocks ran together in one huge sore, leaving her ruined face covered with deep reddish craters. View All 9 Articles in "Uppity Women Wednesdays"
Haunted by the Evil Eye? Grab the nearest phallus!